The period between the decline of the Greco-Roman civilization and the Renaissance, which spans nearly 1000 years, is generally described as the Dark Ages in European history, in which no note-worthy developments in science, medicine and technology took place. 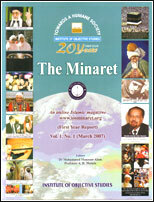 This period roughly coincides with the Golden Age of Islamic science. 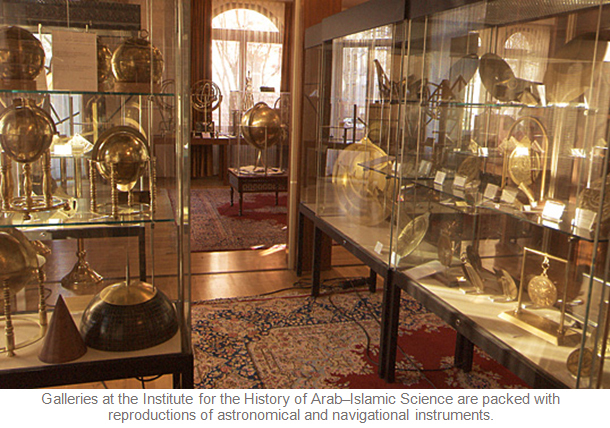 During the Golden Age of Islamic science, between the 9th and 16th centuries, Muslim scientists made original, wide-ranging and enduring contributions to botany, chemistry, medicine and surgery, optics, anatomy, astronomy, mathematics, technology, cartography and geography and navigation. There is now a substantial, and growing, literature on the subject in English, German, French, Spanish and other European languages as well as in Arabic, Turkish and Persian. The compass was invented by the Chinese in the 10th century. 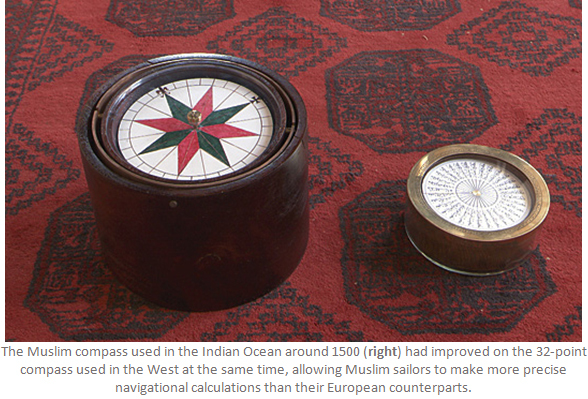 Arab sailors and navigators were familiar with the compass in the 12th century. An Arab work on astronomy and navigation, written in 1242, describes a compass seen on a voyage from Syria to Alexandria that was in the shape of a hollow iron fish that floated on water in a bowl. 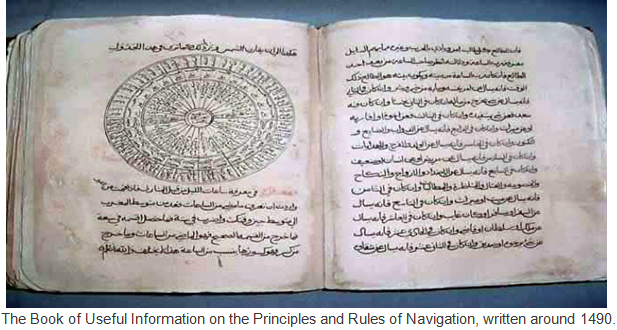 Muslim navigators wrote treatises on the principles and methods of navigation, based on the observations and experiences of their predecessors and the lore of seafarers and navigators as well as their own experiences. An Arab navigator Ahmad ibn Tirawayh wrote some monographs on navigation in the beginning of the 11th century. Another Arab navigator, Khwashir ibn Yusuf al-Arki was known for his extensive navigation in the Arabian Sea in the 11th century. Fuat Sezgin has pointed out that until the 18th century, eighty per cent of the history of cartography dated from the medieval Islamic period, and only twenty per cent came from the ancient Greeks and the later European sources. 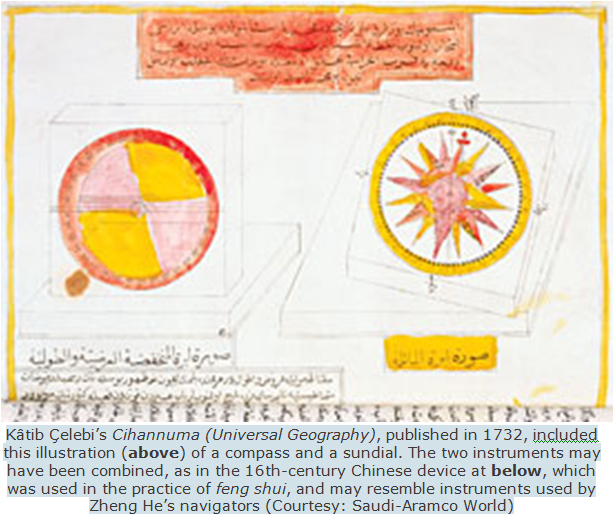 In the Middle Ages, Chinese and Korean maps used Arabic, not European, place names, he adds. In Portugal, tables of the sun’s declination, which were compiled for mariners on the orders of King Manuel I, were based on the tables prepared by Arab navigators in the mid-13th century. The first European printed book on navigation appeared in 1509. It described a method of “raising the Pole Star,” which was borrowed from Arab navigators. In the 15th century, four major inventions had a highly significant and far-reaching influence on seafaring and navigation and ship building. These were the axial stern-post rudder, the lateen sail, “fingers” and the compass. The axial stern-post rudder, which was developed by the Chinese in about 1000 CE, greatly facilitated sailing and made it safer. This innovation reached the Mediterranean around the 13th century. The lateen sail allowed dhows and other ships to sail close to the wind. In the mid-15th century, the Portuguese and Spanish navigators combined the lateen sail with their own square-rigged tradition. The influence of the method of “fingers” developed by Muslim navigators can be seen in the earliest European maps of the Indian Ocean, which give the position of ports in pulgadas (fingers). This method was used by the Chinese sailors as well. 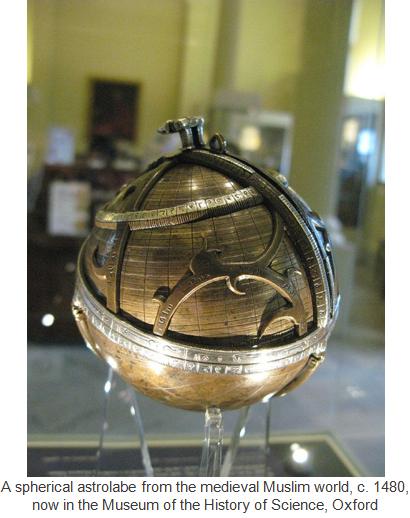 The astrolabe, which was invented in ancient Greece, was used for the study of heavenly bodies and for determining time. It was refined by Muslim astronomers in the 10th century and was used for determining prayer times and for finding the direction of the Ka’aba. 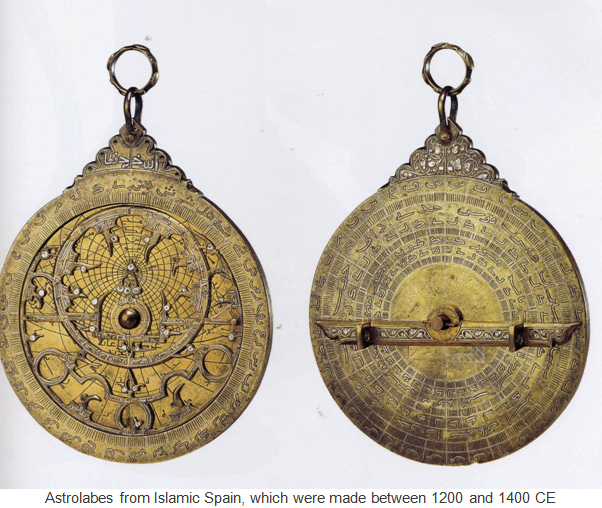 The astrolabe was introduced to Europe from Muslim Spain in the early 12th century, mainly through the works of European scholars such as Pope Sylvester and Hermann the Lang of Reichnau Millas. The mariner’s astrolabe is an ancient device used by navigators for navigation at sea and for measuring the altitude of the sun and the stars. It is essentially a simplified version of the traditional astrolabe. 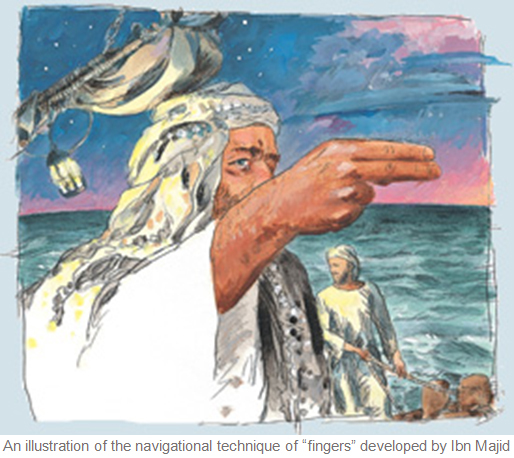 Shihab al-Din Ahmad ibn Majid (1421-c1500) was a highly knowledgeable and experienced navigator. He belonged to a family of famous and experienced seafarers and navigators. Both his father and grandfather were experts in the navigation of the Red Sea. The family originally belonged to Najd in Saudi Arabia. Ibn Majid had an intimate knowledge of both the Red Sea and the Indian Ocean. He was aware of all the sea routes from the Red Sea to East Africa and from East Africa to China. Gabriel Ferrand, a well-known European authority on the history of navigation, described Ibn Majid as the first writer on nautical science. Ibn Majid wrote as many as 38 works on navigation, of which 25 are extant. Two of the manuscripts of Ibn Majid’s works are in the National Library in Paris. His best-known work is Al-Fawaid fi Usul Ilm al-Bahr wal-Qawaid (The Book of Useful Information on the Principles and Rules of Navigation), which was written in 1490. This encyclopaedic work It deals with a wide range of subjects related to hydrography and navigation, including astronomy, the principles of navigation, seasonal winds, typhoons, shoals, islands, monsoons, lunar mansions, the difference between coastal and open-sea sailing, the locations of ports from East Africa to Indonesia, star positions, and ship management. In discussing these topics, he drew upon the observations and experiences of his father and grandfather, the lore of sailors and navigators in the Indian Ocean and his own experiences. In the medieval period, there was a great demand for spices in Europe and China. China imported three times as much spices as the Europeans. In medieval Europe, spices imported from India, Sri Lanka and Indonesia were part and parcel of the lifestyle of the affluent classes. The European elite relished food that was seasoned with saffron, ginger, cloves, pepper and cinnamon. When Isabella, the daughter of Portugal’s King Manuel I was betrothed to the Hapsburg emperor Charles V in 1521, her dowry was paid largely in sacks of pepper. 3 In the 17th century, wealthy merchants in the Netherlands were nicknamed “pepper sacks”. In Portugal, captains and officers received part of their wages in the form of spices. The paramount consideration in the Portuguese expeditions to India in the medieval period was to establish Portuguese monopoly over the spice trade. In the 15th century, Portugal’s Prince Henry the Navigator established a school of seamanship at Sagres in southern Portugal where he brought together a group of competent and experienced geographers, cartographers, astronomers and navigators. Henry was particularly interested in finding a sea route to India that would give Portugal access to the lucrative spice trade. The city of Calicut on the Malabar coast was at the centre of the spice trade and it attracted traders from the Red Sea and the Persian Gulf. The king of Calicut, known as Zamorin, was a Hindu, but Muslim traders from Gujarat held a respectable position in the city. The spice trade from Cochin to the Persian Gulf, Egypt and Europe was dominated and controlled by the Muslim rulers of Egypt via the Red Sea. For nearly four decades, Henry sponsored voyages of exploration along the west African coast. These explorations spawned a profitable trade in slaves and gold. Vasco Da Gama then sailed to Mombassa, where he came across an extremely knowledgeable and experienced navigator, Ahmad ibn Majid. Vasco Da Gama recruited him and asked him to guide him to the sea route to India. It took 27 days for da Gama’s fleet to cross the Arabian Sea via the Lakshadweep Islands. They reached Calicut on 20 May 1498. Though da Gama’s first visit to Calicut was not a failure, it was not a success either. The representatives of Zamorin burst into laughter when they saw the gifts the Portuguese had brought. The gifts included 12 pieces of cotton cloth, four scarlet hoods, six hats, four strings of coral, six washbasins, a cane of sugar, two casks of oil and two casks of honey. “The poorest merchant from Makkah, or any part of India, would give more,” they sneered. The Zamorin told da Gama when they paid a visit to him before leaving that what he would expect from them was gold, silver, corals and scarlet cloth. 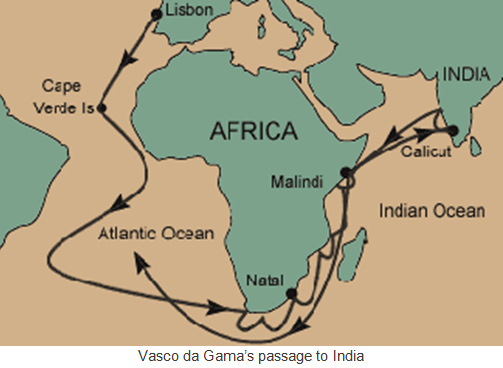 Vasco da Gama’s voyage back to Malindi was beset with misfortune. The monsoons were against his fleet and the 3,700-kilometre journey took three months. Thirty of his crew died from scurvy. The Muslim king of Malindi offered fresh meat and oranges to the surviving crew. When da Gama’s fleet returned to Lisbon on 18 September 1498, only 55 members of his 170-strong crew had survived the arduous voyage. Nevertheless, they had brought a huge quantity of spices from Calicut. Da Gama and his men were accorded a hero’s welcome in Lisbon and they were paraded through the streets. In 1500 a second voyage, involving 13 ships and 1,200 men was dispatched under Pedro Alvares Cabral to secure the sea route to India. The fleet after a journey of six months. The Portuguese brought lavish gifts for the Zamorin, hoping that he would be tempted to sign a trade agreement with them. The Muslim traders were furious and outraged at the attempt of the Portuguese to steal their trade and killed 50 of Cabral’s crew. Cabral retaliated by burning 10 Muslim cargo vessels and killing nearly 600 Muslim men on board. He then moved to Cochin, where he established India’s first Portuguese trading post. The Portuguese thus succeeded in breaking the monopoly of Muslim and Venetian merchants over the Indian spice trade. The following year, Vasco da Gama commanded Portugal’s third major voyage to India with a fleet of 20 ships. Da Gama carried out raids on several Muslim ports along the east African coast. Off the Malabar coast, he seized a ship that was carrying 400 Muslim pilgrims on a return journey from Makkah and set it on fire. All the men, women and children on board died in the fire. He then moved on to Calicut, where he captured and dismembered 30 fishermen. On his return to Lisbon in September 1503, da Gama was richly rewarded and was eventually appointed the Viceroy of India. 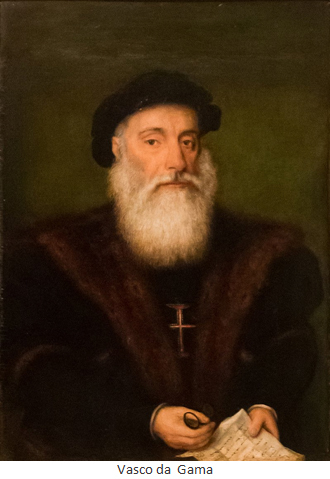 In 1502, the king of Portugal, Dom Manuel I (ruled 1495-1521) appointed Vasco da Gama as Captain-Major of the fourth Portuguese expedition to India, with a fleet of 20 ships and armed with heavy guns. 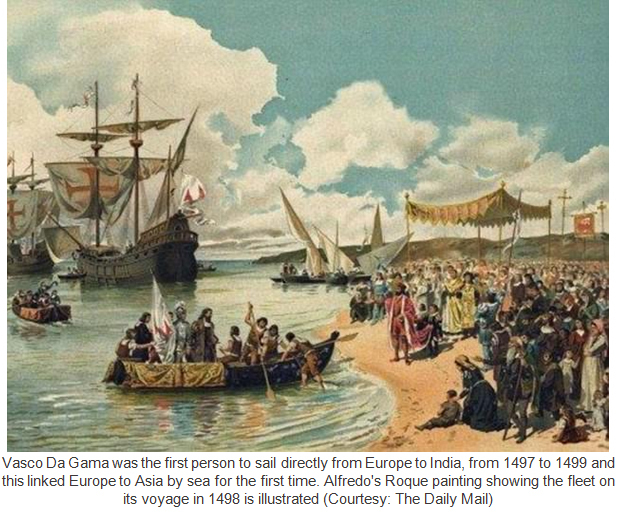 Da Gama returned from India in 1503, leaving behind a five-ship squadron under the stewardship of his uncle, with the purpose of protecting Portuguese factories along the south-west coast of India. After Vasco da Gama’s departure, his uncle, Vincente Sodre, sailed in the ship Esmeralda to the Gulf of Eden, where he seized and looted several Arab ships. Sodre’s ship was anchored at Oman, where it was struck by a fierce storm. While the crew swam to the shore, the ship sank in deeper waters. 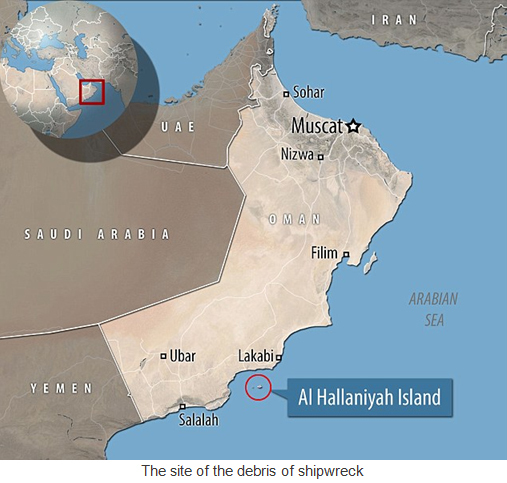 The site of the shipwreck was first discovered and explored off the coast of Oman in 2013 by a team of marine archaeologists and divers from a British company Blue Water Recoveries and the Oman Ministry of Heritage and Culture. 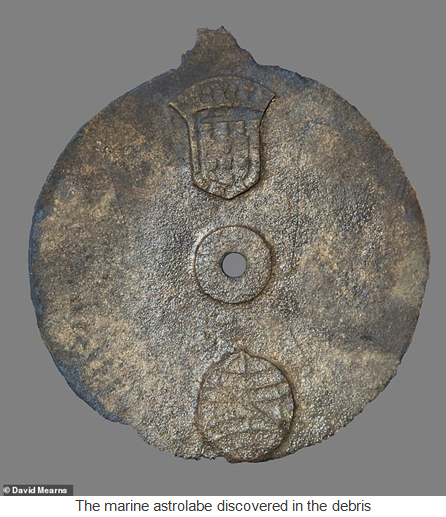 The remains included a 500-year-old copper disk – a marine astrolabe – which is believed to have been made between 1496 and 1501. It has now been confirmed that the debris found there came from one of the ships from Vasco da Gama’s second voyage to India. The findings of the exploration were published in the International Journal of Nautical Archaeology in March 2019.